Whenever locals in Phoenix, AZ and the surrounding areas lock their keys in their cars or misplace their car keys, they contact 602 Locksmith. Our technicians never cut corners when they tackle car lockouts; we only use high-tech tools and equipment because they help us complete each task efficiently and effectively. Our technicians understand how to use the latest tools since they are highly trained and highly educated in auto locksmithing. If you ever need help on the side on the road or on your driveway, call 602 Locksmith. One of our friendly employees will send out a technician to help you at any hour. Our clients appreciate that we offer vehicle locksmith services in Phoenix for car lockouts. Because the process of accessing a car on the highway is tricky, we always bring the proper tools to project sites. Usually, our technicians open car doors with a steer bar. We may also use J tools if a vehicle has a high lock button. These tools are designed so that they can reach difficult unlock buttons. Our roadside services are valuable because we help people avoid potentially dangerous situations on the highway. For example, if someone locks a key in a car on a road that dips, other drivers may not see the car instantly when they approach it. Because we travel to project sites without any delays, we help our clients protect themselves and their vehicles. Need A Spare Car Key? We Cut Keys On-Site! We cut keys for our clients for a number of reasons. Typically, people contact us and use our services when they chip, damage, or lose their car keys. In some cases, locals also request our services when they need a duplicate key for a vehicle. Our locksmiths can program and cut keys for motorcycles, vans, and a variety of cars of all makes and models, both foreign and domestic. We provide locksmith services throughout the day and night. Clients typically call us when they lock themselves out their cars in the morning before work or at night on the highway. All of our locksmiths are totally trustworthy. This is important because people always want an honest answer before someone uses tools on their expensive vehicles. Our technicians have the proper credentials and skills for every project. This is why Phoenix drivers contact our company instead of other companies. We offer various services to locals in Phoenix, AZ and the surrounding area, so our clients never have to find other locksmiths for other work on their vehicle’s locks. Since our company is licensed, bonded, and insured, we provide more security to our clients. Most people contact locksmiths when they lock themselves out of their vehicles before important business events. This is why locals need reliable and dependable locksmiths. 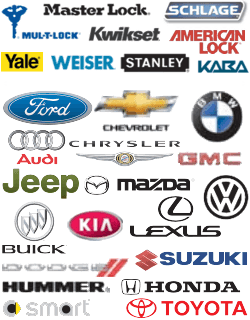 We have a great list of happy clients because of our comprehensive service for replacement car keys. This process of unlocking a vehicle is not easy so experience is extremely important when tackling car lockouts. Our technicians have years of experience tackling auto locksmith projects, which is why our clients’ vehicles are never at risk. When people contact locksmiths that offer cheap services, the technicians usually do a lousy job. We understand that the quality of work matters. As a result, we only hire technicians who have 5+ years experience and who can successfully solve all car locksmith problems, such as a key that breaks in a lock. Remember, if you need locksmith services, contact us for a free quote. Our clients appreciate that we offer upfront pricing, 24/7 locksmith assistance, and fast and friendly services. All of our technicians are bonded and insured. Our expert technicians never delay once a call is made; we are proud of our 30 minute response time, which is especially important for car lockouts in Phoenix, AZ and surrounding areas. Call 602 Locksmith 24/7 for Assistance with Car Lockouts in Phoenix! Car Lockouts http://602locksmith.com/car-lockouts/ 3.3/5 based upon 13 reviews.